I can never have enough cards in my stash to send to friends and family who are going through tough times. I love being able to send a smile or hug in the mail! I think Lg. 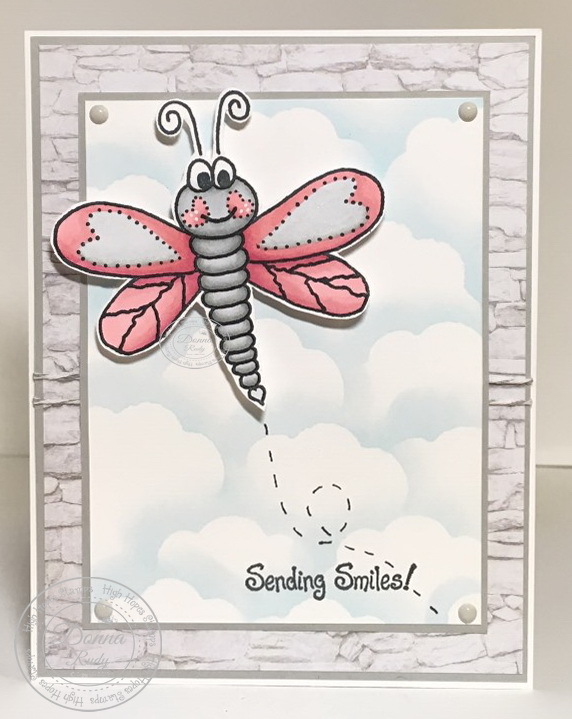 J's Dragonfly fits the bill to bring a smile to someone - especially with those heart shaped cheeks! She definitely makes me smile! I coloured this cutie with alcohol markers and hand fussy cut it leaving a thin white edge then popped her up with foam pop dots. 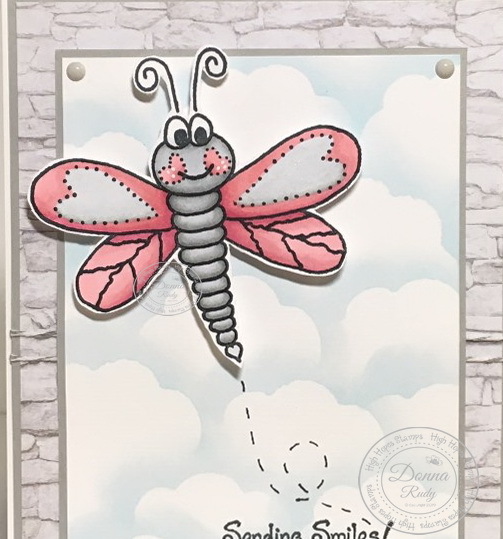 I added some dots to her cheeks with a white gel pen and because I like a little sparkly somewhere on my cards, I added some clear sparkle pen to the hearts in the wings. 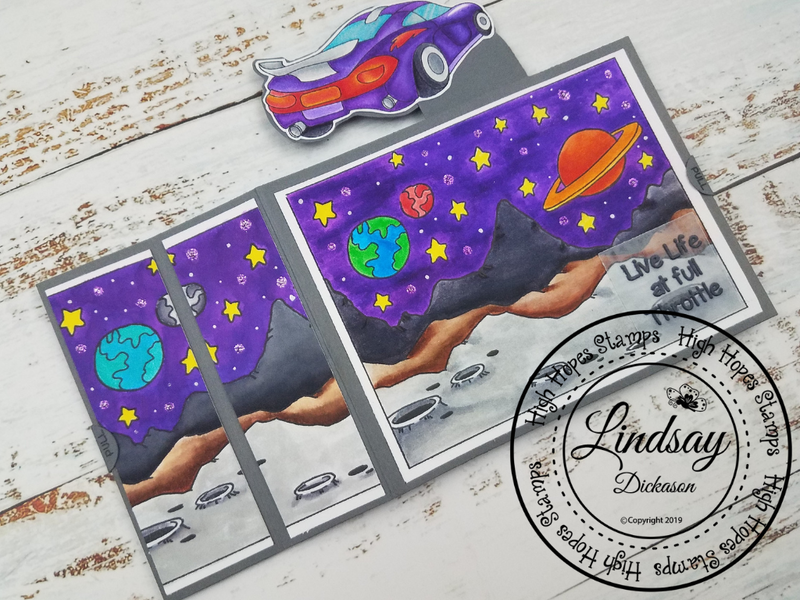 I set her aside and die cut a cloud and grabbed my dauber and ink to create my sky background. Next I cut it to size and put it in my trusty Misti to stamp the sentiment in the perfect spot. I lightly drew the dashes with a pencil and then went over them with black marker once I was happy with their placement. 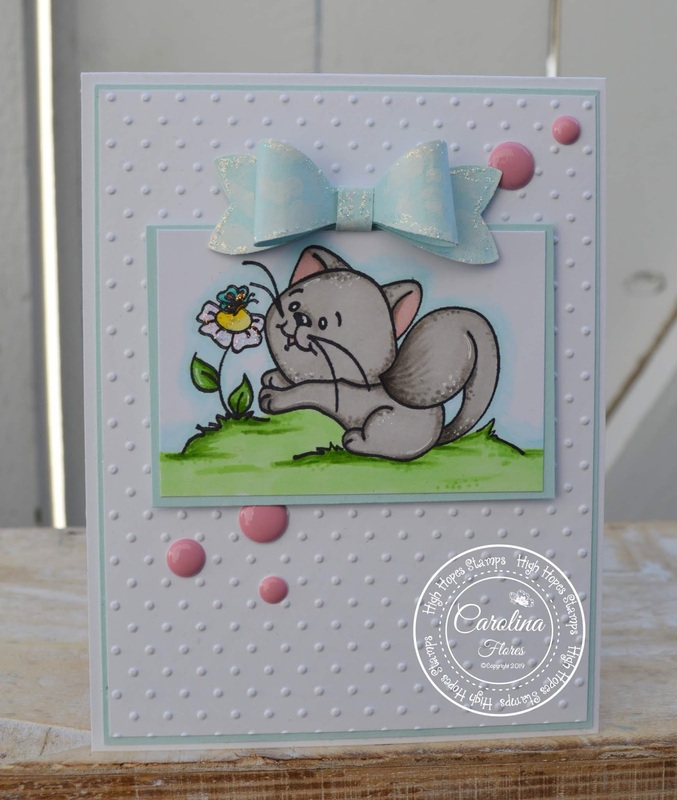 Some twine and gumdrops finish off this fun, CAS style card. Be sure to stop by the High Hopes Rubber Stamps Facebook page and blog for daily inspiration from the design team! Freezing cold then suddenly flames of heat! Not fun. This card did give me a chuckle. My look alike image is "Online Olive" and she was fun to color! I used my Copics (colors below) and then used a little Nuvo sparkle on the steam from the cup and the smoke from the computer. Scrap papers with a bit of shine to them give a little more life. All the layers are sewn down with dots of Nuvo black for embellishment. That sentiment is just a scream. "I don't have hot flashes, I have power surges!" There are so many fun image like this at High Hopes! 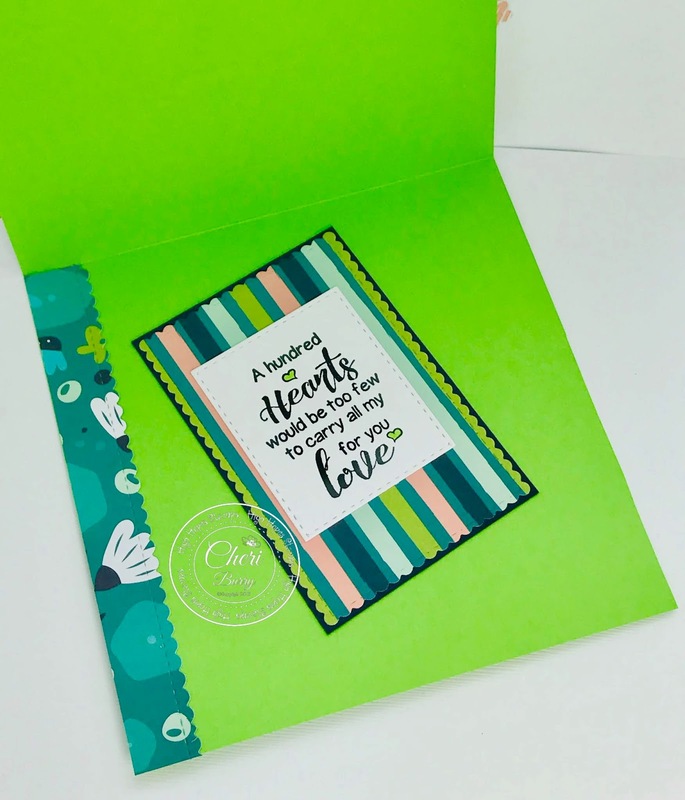 Love cards that bring a smile don't you? And a chuckle... Laugh out Loud is even better. There's nothing cuter than these two pigs having fun in the mud! 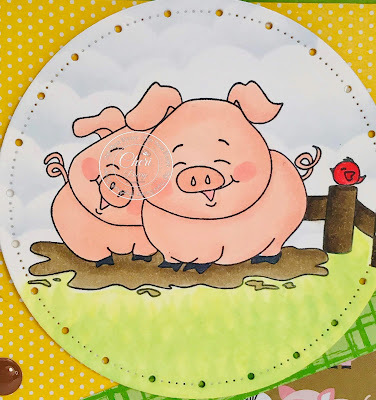 This stamp is called "Happy Pigs" and is from High Hopes Stamps! 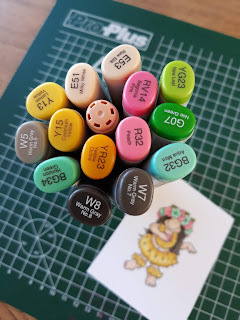 To start, I stamped and coloured my image with my Copic Markers. After I die cut a circle around the image, I masked them off with masking paper. Then I added some clouds and grass to the image using the MFT Mini Clouds, Grassy Edges stencils and inks to create an outdoor scene. 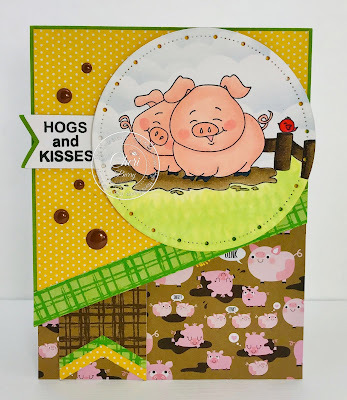 I love the "Barn Yard" paper from Bella Blvd. It's my go to "Farm" paper. 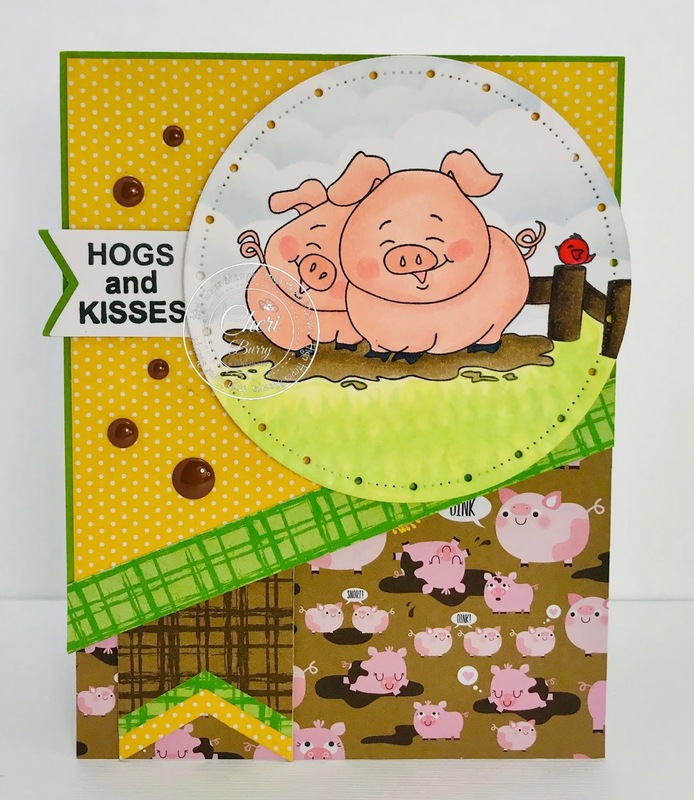 A few enamel dots and the HH "Hogs and Kisses" sentiment finish off my card. I always like to use scraps of the designer paper on the inside of my card for a finished feel. 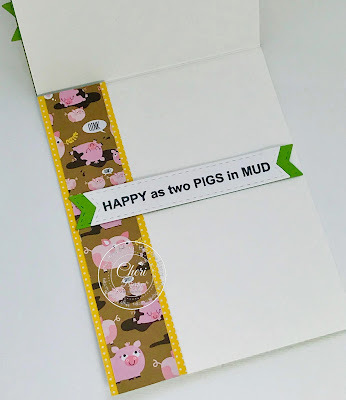 I added the HH sentiment called "Happy As 2 Pigs" which of course matches the card theme. 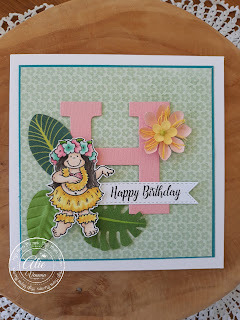 Make sure to head on over to the One Crazy Stamper and High Hopes Blogs for tons of inspiration from the Design Team! 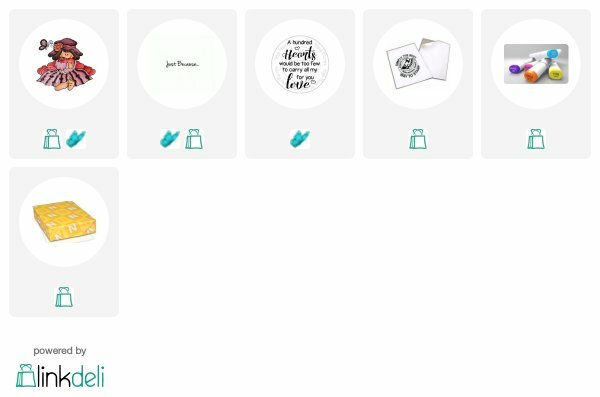 Keeping my card a little simple and whimsical this week. After my image was coloured I used a white pen to give interest to my kitty. Also add diamond stickles to y flower and butterfly. The white cardstock was sandwich with a cuttlebug "swiss dots" embossing folder. 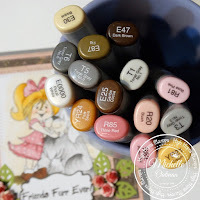 I add some off white acrylic paint to my cardstock bow and diamond stickles. To finish I adhesive a few pink candy dots. 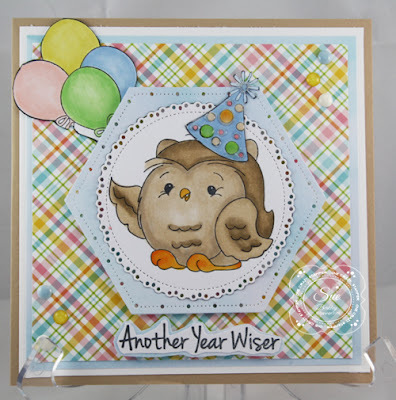 Hope you have enjoy my card today! It's such a beautiful Spring day here! I love the warm feeling of sunshine after days of cold weather.. So inspired by the sunshine I colored up Leilani today! 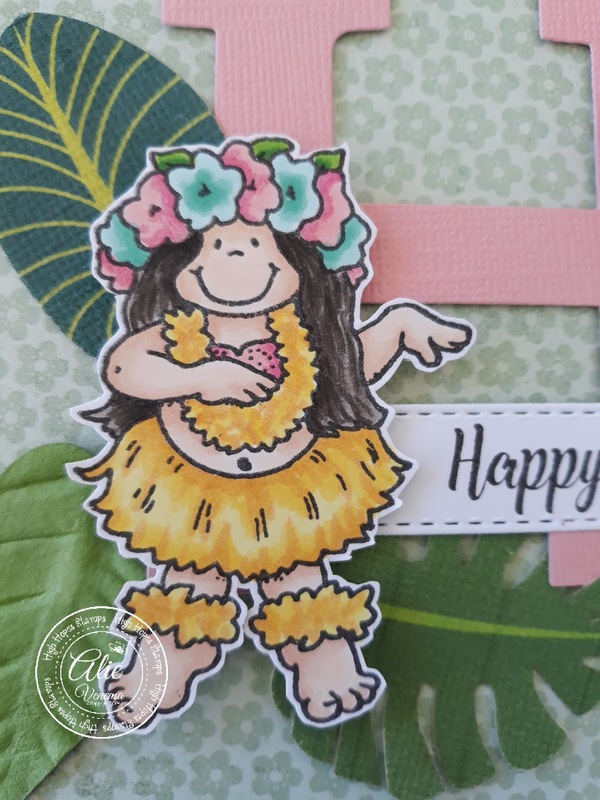 You can find her HERE in the High Hopes Rubber Stamps website. 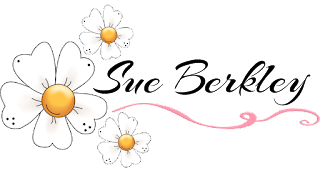 Take a look at our Instagram, Facebook and Pinterest pages for more inspiration! Hello High Hopes fans! I'm super excited because this is my first blog post as part of the Design Team. I'm really happy to be here, to join such a fabulous group of talented ladies on the team, and create projects using High Hopes Rubber Stamps! 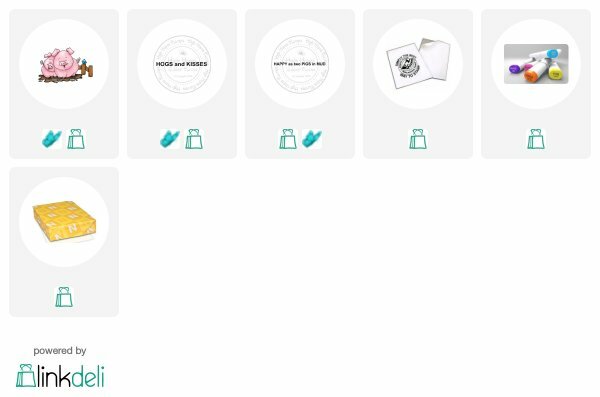 I hope you'll like what I have in store! Today's card is a super fun one; it's a wiper card! This was my first time making an interactive card like this. I've been seeing them all over the place, and I thought that this would be the perfect way to showcase the Super Speed car stamp (which you'll see in a little bit!). I combined it with the Space Scape background stamp and the Live Life sentiment stamp for a super cool, out-of-this-world card! 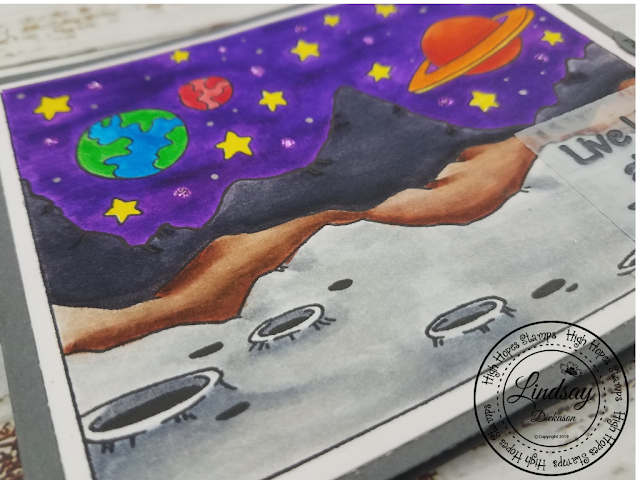 I started by stamping the background in a waterproof black ink on a smooth, heavyweight card stock. I colored it in with my water-based markers and kept the coloring bright but pretty simple. The real star of this card is the wiper action when you pull the sides. I added some small "Pull" tabs on the sides of the card just to help the recipient figure out how to work the card. 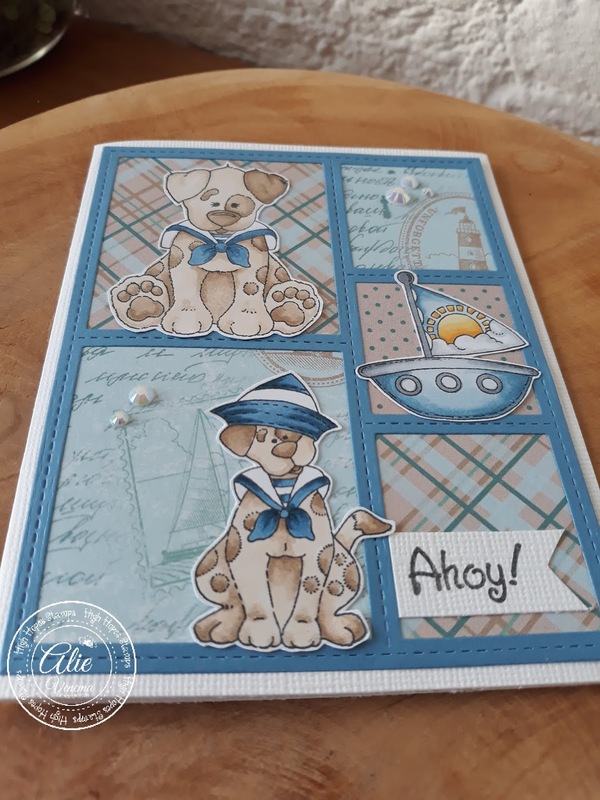 Take a look at my video below to see the card in action! 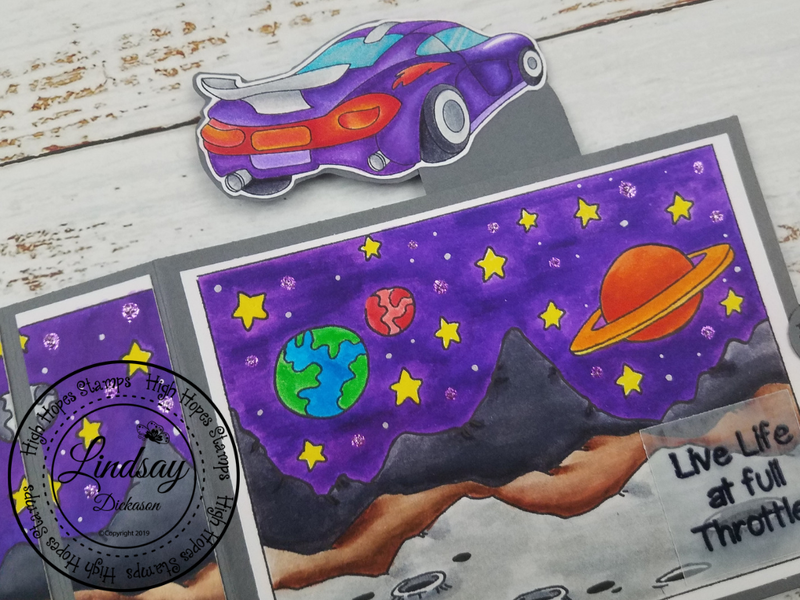 As little extras, I added some sparkly glitter glue drops and dots with a metallic gel pen to give the illusion of a glittery, sparkling sky. I also went over the yellow stars with a glitter brush pen just for a little more sparkle (I love sparkle!). For the sentiment, I heat embossed it in black embossing powder on a small piece of vellum. 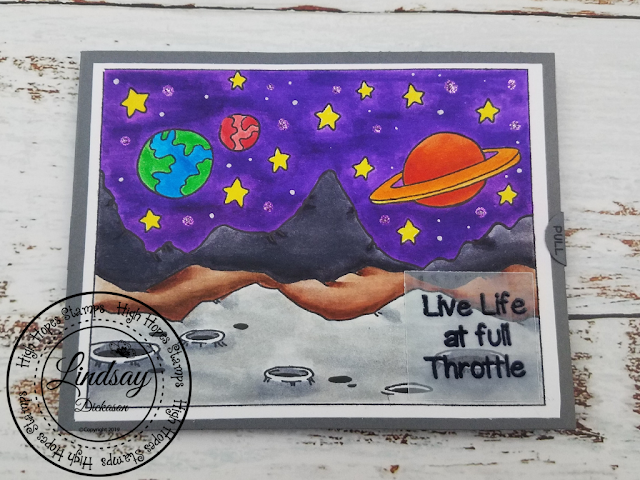 I chose to do this because I wasn't sure that the black embossed sentiment would stand out enough on its own, but I didn't want to completely cover up the background. Vellum was the perfect solution! I'll write a little note on the back of the card, where I mounted a piece of white card stock. I think I'll turn this into a birthday card for my nephew who's turning 6 next month. He'll get a real kick out of it! 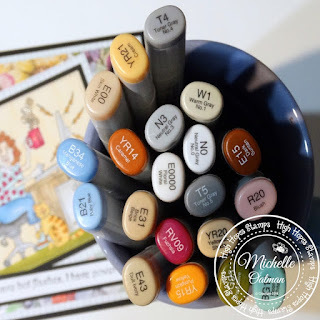 Thanks so much for stopping by the High Hopes blog! I'll say it again that I'm so happy to be part of the team! Be sure to check out our Instagram, Facebook, and Pinterest pages for more High Hopes inspiration! Enjoy your weekend! Have you ever had one of those times when you had envisioned something completely different as to how the card turned out. Well, this is the case for today's card. After a couple of mishaps and completely not what I had in mind, I'm happy with how it turned out. After colouring Waving Owl with Copic Markers, I cut it out using a circle die. To get the effect of the circle die sitting inside the hexagon, I put the same size circle inside the hexagon die and cut them out together. This allowed Waving Owl to sit inside the hexagon. 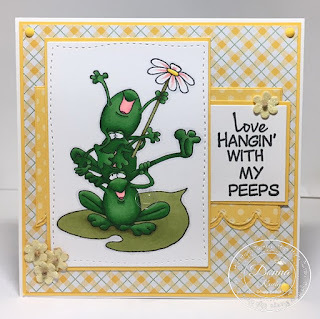 This week I am celebrating my friends! February is the month of love and I love my crazy friends who I like to call my "posse"! You know the ones.......you meet up for an innocent coffee or event, you let your hair down as they say and "things" just happen! You end up making some of the best memories and well let's be honest, maybe relieve a little stress along the way. I am truly blessed to have these amazing women in my life. I chose to use "Froggy Stack" for this card. 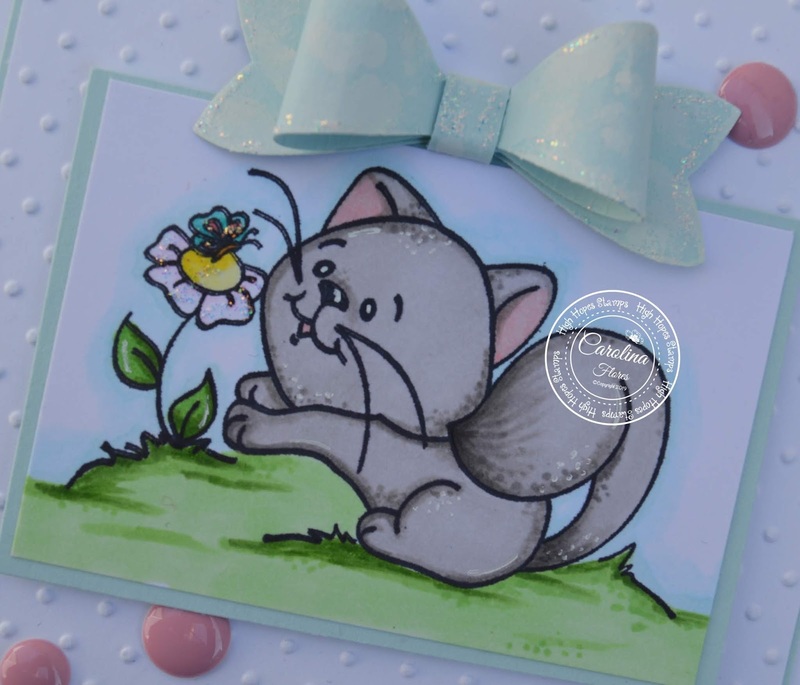 This stamp is one of the first High Hopes stamps I ever won in a challenge many moons ago. I love the fun these three are having......although I think I would probably be the one in middle! After colouring these three friends with alcohol markers I cut it out using a wonky stitched die - perfect for these three fun loving friends! I set them aside and went on to creating my sentiment. 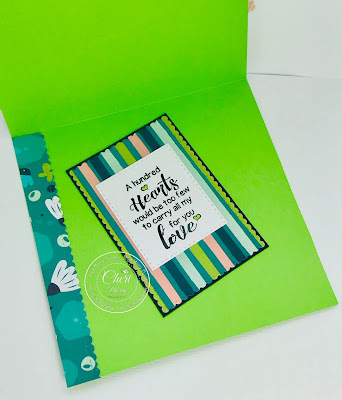 This is two long sentiments combined so I masked each word and stamped them separately. Challenging but I am very happy with the result. 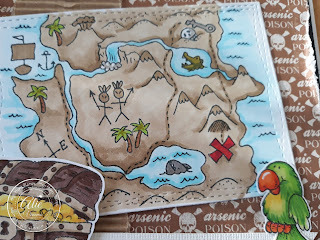 Next I cut my patterned paper from YNS and Echo Park to fit my design and added a stitched scalloped edge just for fun. Some glittery flowers (hard to see in the photo) and gumdrops finish off my card. 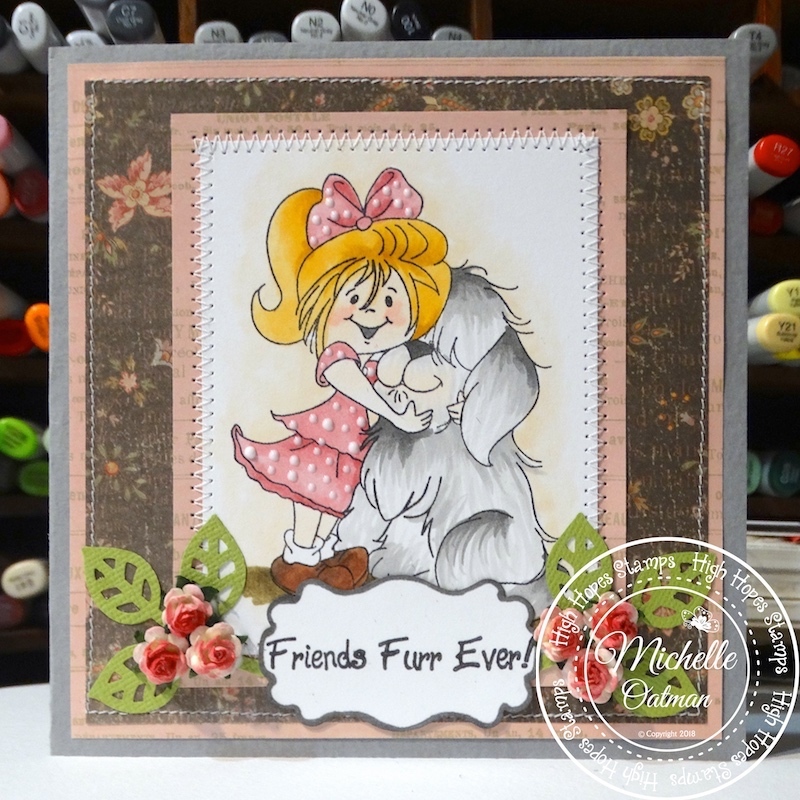 Howdy - MichelleO here today and today I have a little "Puppy Love"
Aren't they a cute pair? I colored with my Copics (colors below) and then she was just screaming to have a polka-dot dress so I dotted her up with Nuvo white dots. 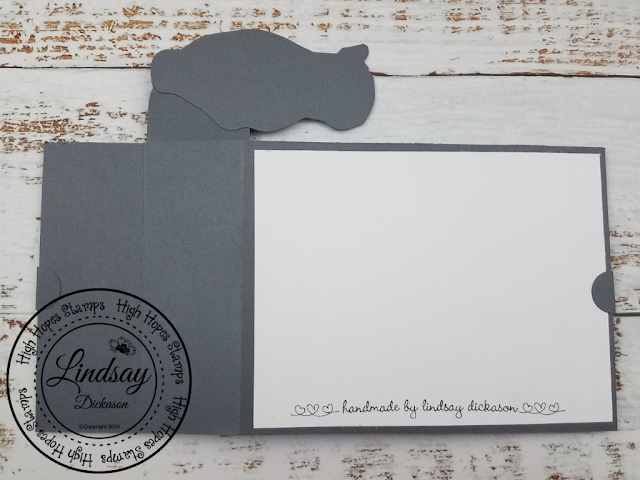 I found papers from Paper Studios that I matched up with a grey card stock base. I sewed all the layers down. Then pulled out some older paper punches. Extra Large Martha Stewart Leaves and then EK Success shape for my sentiment "Friends Furr Ever!" Perfect for this girl and her doggie! Then I added some Mulberry roses. Sweet image don't you think? There is so much to love at High Hopes Stamps! Jump over FAST HERE! Today I am sharing with you a card I made using "Hannah's Heart" from High Hopes Stamps! Hannah is one of the first stamps I had from HH and I haven't used her in a long time. I forgot just how adorable she is and had to ink her up once again! 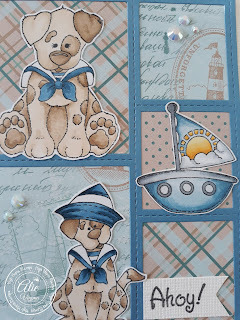 I decided to use papers from the MME "Happy Days" 6x6 collection. I just love the colour combinations in this pack! I made this card for any "love" occasion. The sentiment "Just Because" is also from High Hopes. After stamping Hannah, I coloured her with my Copic markers to match the designer paper. I added some Crystal Stickles to the tiny hearts on her dress, her flower in her hat and the butterfly. Some matching ribbon, bow and adhesive sequins finish off my design. Using leftovers from the designer paper I decorated the inside of my card and added the HH "A Hundred Hearts" sentiment. Today I made a Pirates birthday card for my card stash.. 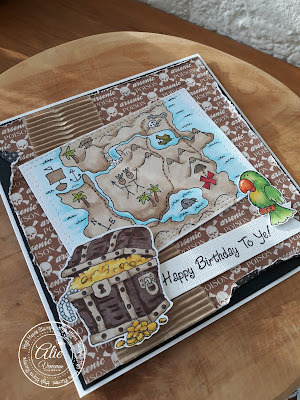 I have a few nephew who are in the middle of the Pirates phase.. so I'll never have too many Pirates cards, hahaha..
Be sure to check out our Instagram, Facebook and Pinterest pages for more inspiration! I had such a good time creating this friendship card. Also using some unexpected colors! I started by stamping my image with Memento Tuxedo black ink and colored with alcohol markers. Fussy cut it leaving a small white border. Used some left over pattern paper and die some small clouds with Impression Obsession die #068-A Now for embellishment I added sequins, pink Nuvo drops, diamond stickles and my white pen. It's a lovely spring day here today! 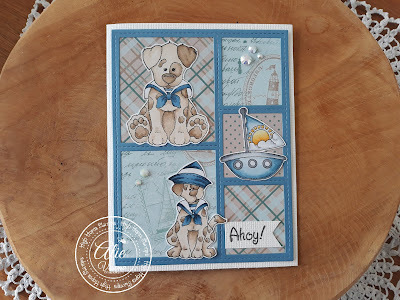 So I am enjoying the summer with this cute nautical Puppy Love card! 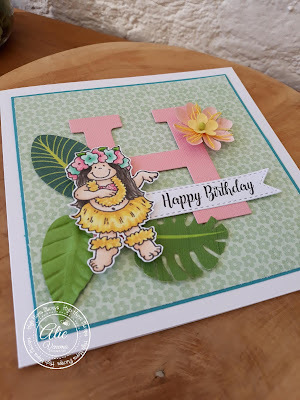 Be sure to check out more High Hopes Rubber Stamps inspiration at our Facebook, Instagram and Pinterest pages! Kovu and Leo, from High Hopes Stamps are the best of friends traveling together and enjoying the journey. After stamping Kovu and Leo, I coloured them with Copic Markers and used Prismacolor Pencils to add some highlights.